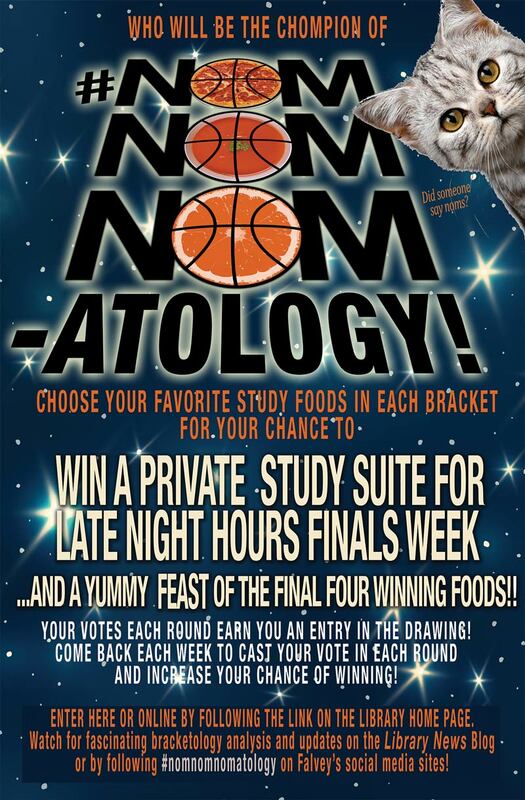 Falvey Memorial Library :: Nomnomnomatology: A Mouth-Watering March Madness Begins! Nomnomnomatology: A Mouth-Watering March Madness Begins! What was that sound? Was that a lion? A tiger? A WILDCAT?! Oh, sorry. It was your stomach grumbling–how rude of me. It’s completely understandable, because all that studying can make a person hungry—hungry for some March Madness BRACKETOLOGY! But wait, you say, that doesn’t make any sense – I can’t eat a basketball! Well, not with that attitude you can’t. You might remember from years past that Falvey’s tournament has seen a fierce battle among authors and fictional characters—because well, yes, we are indeed a library and books are our jam. But while our stacks are here to serve, we are also your cultural commons and your haven on campus. We’ve got cozy nooks and crannies, couches and tables, clever librarians and oh, so many events. Now, in honor of March Madness, we are revealing this year’s bracketology lineup. Commence voting. This year, it might just work in your flavor—er, favor! At the front entrance of the Library, you’ll see a giant bracket with a smorgasbord of dorm-friendly comfort food teams—historically strong contenders like Mac n’ Cheese, the clear underdog Lukewarm Spam, and ol’ faithful Ramen—and it’s up to you to choose our chompians. The competitions will be intense: 90s kids won’t know what to do with GoGurt versus Dunkaroos—and kale versus mashed potatoes? Who came up with these? Every round, you have the opportunity to enter a drawing for your own personal study room for you and your friends from May 3 through 7, 6 p.m.-3 a.m. On Monday May 4, we will serve you the top four foods from our bracket! To enter in person, use the box by the printed bracket at the front desk. Or vote online here. Online voting counts as an entry to the drawing. The winner must be a current Villanova student and must present a valid Wildcard to receive room access.